Ken Kremer for NASA Watch, 4 June 2010, NASA Michoud Assembly Facility, LA: America's first Lunar Test capsule for people since Project Apollo has just been welded into shape. This work finishes the structural framework of the pioneer Orion crew cabin - known as the Ground Test Article - or GTA, by a Lockheed Martin contractor team toiling away at the historic NASA-owned Michoud Assembly Facility (MAF) in New Orleans, damaged during Hurricane Katrina. The GTA is the essential forerunner of a crewed spacecraft which NASA had intended to utilize for a return of human footsteps to the Moon, and then to Mars and beyond until President Obama proposed to wholly terminate Project Constellation, including Orion, in his initial 2011 budget proposal and radically alter NASA's future path. "The Orion GTA is the flight test article that was designed in support of Lunar Missions," explained Mark McCloskey to me during my fact finding visit to Michoud to observe the capsule first hand. McCloskey is the Lockheed Martin Senior Production Manager for Orion at Michoud. McCloskey and other senior Lockheed representatives spoke to me in depth about Orion development at NASA's Michoud manufacturing facility in New Orleans. Michoud is also the production site for the Space Shuttle's huge External Tanks, which I'll report on separately. This GTA test vehicle is not the de-scoped and stripped down, unmanned "rescue lifeboat" recently proposed by President Obama at his April 15 space policy speech at the Kennedy Space Center (KSC) where he resuscitated the Orion project, but with limited objectives and functionality. President Obama's space proposals have been harshly criticized by many Apollo era veterans, including astronauts Neil Armstrong, Jim Lovell and Gene Cernan, key members of Congress and many others in academia and industry as a "Blueprint for a Mission to Nowhere" with no firm goals or destinations and at the cost of tens of thousands of US jobs in the midst of the global economic recession. The Lunar and Deep Space capable Orion would have to be redesigned at additional cost and time to restrict its capabilities to those of a "Lifeboat to LEO" rather than a "Bold Journey to the Moon." Everyone working on Orion clearly hopes that the vehicle will move forward and that the "Lifeboat" scenario will serve as a stepping stone back to the long duration interplanetary functionality for which Orion was originally conceived. Several billion taxpayer dollars have already been invested, but the future course and funding from Congress are unclear. It was remarkably easy to imagine myself floating weightlessly through the crew tunnel to enter the ISS or NASA's planned Altair Lunar Lander and embark on daring new Science journeys of Exploration and Discovery, now canceled by the Obama Administration. "The GTA is a manufacturing pathfinder to validate production processes and tools," McCloskey told me. 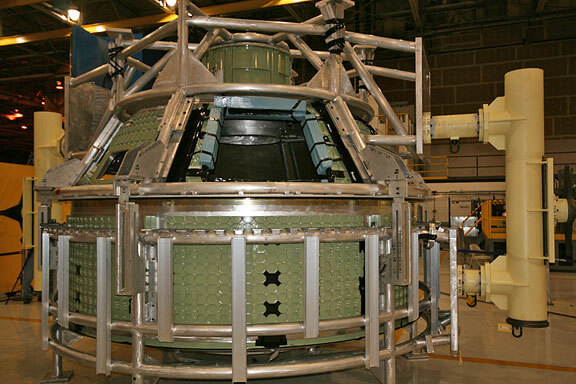 "It is the first full-sized, flight like test article in the Orion crew exploration program." "As intended, we have learned valuable things every step along the way during development and construction. It's been a great experience. We are utilizing technologies that have not been used on spacecraft before." "Everything inside Orion and all subsystems will be state of the art," Larry Price, Lockheed's Deputy Program Manager for Orion explained to me. "Orion is not Apollo on Steroids ! ", stated Price. "The main task of the GTA team is to quickly and economically deliver a vehicle for all kinds of flight testing including stress testing, environmental correlations, drop tests and more," McCloskey added. 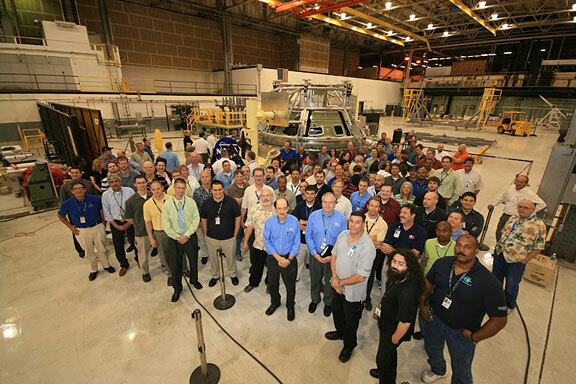 This key assembly milestone was accomplished by welding together the last two large individual segments of the crew cabin using new and complex advanced technology processes specifically invented and developed for Orion, by a technique called Friction Stir Welding (FSW). The FSW process is conducted with a machine called the Universal Weld System (UWS) and is robotically controlled to exacting precision. The UWS is a one-of-a-kind machine and the largest in the world. "We finished the close out FSW weld - number 33 of 33 - on May 27 at 8:30 in the evening," McCloskey explained. 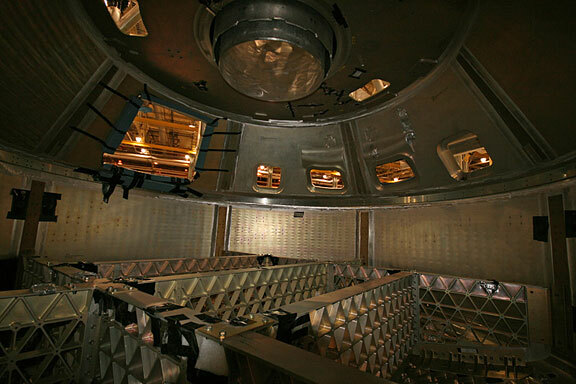 "The final close out weld joined the Forward Cone Assembly and Crew Tunnel to the barrel shaped Aft Assembly." See photos below. The combined structural framework comprises the habitable volume for the initial 16.6 ft (5 m) diameter Orion crew cabin, which is 2.5 times larger than the Apollo era Lunar capsules. "That final FSW weld was 440 inches in length and took 38 minutes. Of course there was a long period of preparation and development laying the groundwork for leading up to the welds involving all the set up, measurements, and programming to schedule the path of the computer controlled operations," said McCloskey. "These final welds are the longest FSW welds ever attempted," according to Larry Price. "Altogether there were 33 FSW welds using the Universal Weld System machine. All were successful," says McCloskey. "They proceeded to completion without interruption." 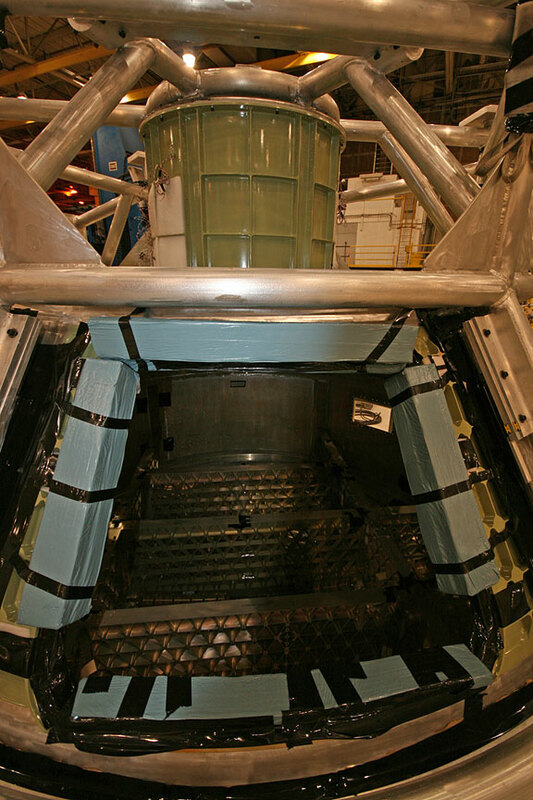 "Prior to starting, we did alot of development work on the FSW process using External Tank type hardware. That work replicated all the types of complex welding procedures that we would be implementing on Orion. These include self reacting circular, longitudinal and circumferential welds." "The GTA panels are built from an Aluminum-Lithium alloy that contains about 1% Lithium by weight," Mark Cantrell explained to me. Cantrell is Lockheed's Welding Manager at Michoud. "We ran numerous experiments to optimize the lithium content and maximize the strength, rigidity, weldability and corrosion protection of the panels." Due to the high lithium content, the thickness of the panels is limited to about 2 inches, he said. To build a precision type vehicle requires predictability, which is sorely lacking in standard fusion weld procedures which melts and shrinks the metal pieces with inconsistent results. Friction Stir Welding is a highly precise and robust solid state welding process used for joining metallic components in a repeatable and predictable manner. The metal never melts in FSW. That's the distinction and a key advantage. The 2 halves are butted together and a rotating pin is protruded into the joint which generates friction and swirling something like butter. The metal is softened and stirred as friction is generated by the spinning pin. This plasticizes, but does not melt, the metal and thereby welds the metallic pieces firmly and precisely together. 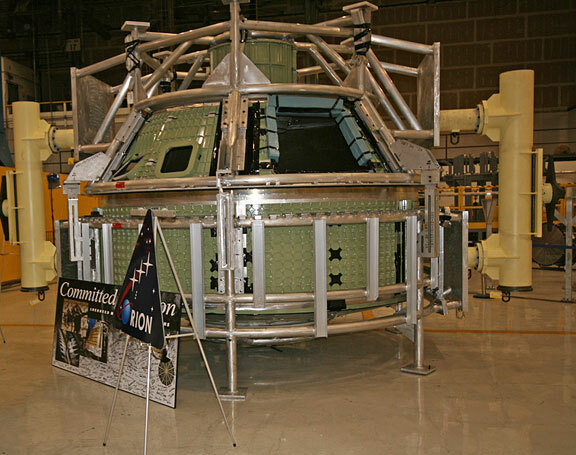 "Having an exact fit makes a critical difference in Orion, particularly with regard to fitting the crucial Thermal Protection System (TPS) heat shield tiles precisely in place," says McCloskey. The next step in GTA assembly is pressure testing later this month. "Hundreds of strain gauges at numerous locations have already been meticulously attached to individual segments of the GTA to measure the overall vehicle strain during development and loads testing," Lockheed spokesman Kevin Barre told me. 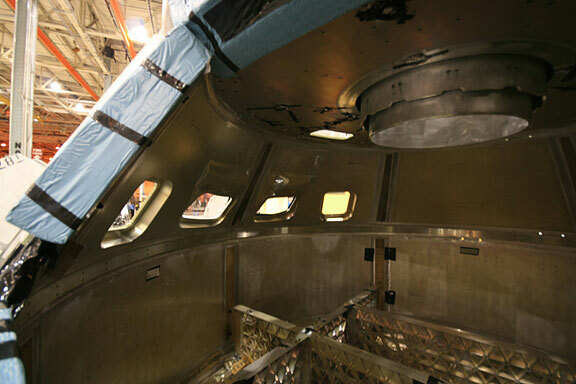 After pressure testing, "the GTA framework will be outfitted with internal and external mass and volume simulators for components like the crew seats and consoles, lockers, life support, environmental control, waste management, and more," explained Tim Knowles. He is the Orion GTA Vehicle manager for Lockheed Martin at Michoud. "On the outside we'll add simulators for the batteries, parachutes, compressed gases, propellants and thrusters all around the shell we welded together," added Knowles. "Then we'll add the simulated TPS aeroshell around that, including a few real TPS tiles." "When all the work to prepare the GTA is done, the final Orion GTA crew cabin will look very much like a real Orion capsule," Knowles said. Lessons learned from the upcoming stringent testing regime planned for the GTA will be incorporated to aid in changes to the crew cabin, tools and manufacturing processes that will eventually produce a human rated spacecraft. "About 86 people are currently working on the Orion GTA project at Michoud," according to spokesman Kevin Barre. "Overall roughly 4000 people are employed on Orion, working at over 100 companies all across the US. We are already purchasing hardware for testing and engineering development units," Price explained. "Our work is continuing with the funding which is still approved until September 2010. Of course we don't know what will happen with the budget and plans for next year. That's all up in the air." Within the past week or so there have been some funding and personnel cutbacks announced in the Orion program which will without a doubt hinder forward progress. However, Lockheed is attempting to reallocate people to other programs to try and avoid outright layoffs. "We all love what we are doing. We have a team, young and old, who are all very committed to the Orion program. We want to put astronauts into space and continue building the Orion for the foreseeable future and beyond." "This is the type of job that a tremendous number of people want to work on because they realize the end result is amazing. So, we never had problems trying to get people to work on this program. Orion is the kind of program that we'll tell our grandkids about and be proud of working on forever," McCloskey concluded. Look for my upcoming separate features on the final two shuttle ET's being manufactured at Michoud.